The location of Building o was the site of two successive log cabin structures that generally occupied the same footprint. The earlier of the two buildings was built in ca. 1771, but its interior structure cannot be determined exactly. In the 1796 Mutual Assurance Plat, Jefferson identified it as Building o, "a servant�s house 20 1/2 f. by 12 f. of wood, with a wooden chimney, & earth floor." 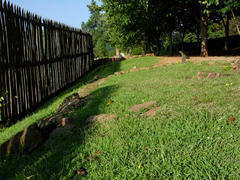 Archaeological excavations uncovered the cabin's foundations, two sub-floor pits used for storage, and thousands of discarded artifacts, some of which can be seen in exhibitions under the main house and at the Monticello Visitors Center.